If you have Adobe Acrobat Standard, you can use Microsoft Word 2007 to create PDF documents. The utility that makes this happen is called PDFMaker. In my case I do have the Adobe Acrobat Standard, so when I open Microsoft Word 2007, I do see an Adobe Tab as shown below. The first thing we will look at is how to create an acrobat PDF document from my current Word document. In order to do that, you click on Create PDF command on the Create Adobe PDF group. Here is a screen shot of what I’m talking about. When you click on the above command, the Save Adobe PDF file dialog box opens up. This is illustrated in the figure below. Go ahead and enter the name of the file and then click on Save. This will start the process of converting a Microsoft Word document into an Acrobat PDF document. After the process completes, you will have a PDF document as shown below, very nice! You can now email or print this document if you like. If you wanted to change the settings in the PDFMaker, you can select the Preferences command under the Create Adobe PDF group. Here is a screen shot of the preferences dialog box. Next we will look at how to create a PDF document and email it to somebody. First click on Create an Attach to Email command on the Create and Email group. This is shown below in the screen shot. This will start Save Adobe PDF File As dialog box. You can type in a name for the file and then hit Save. If you are running Microsoft Outlook on this computer, a new email message should display on your screen. The PDF document will be attached to this email as shown below. With the PDFMaker utility, you can also use mail merge on a PDF document. 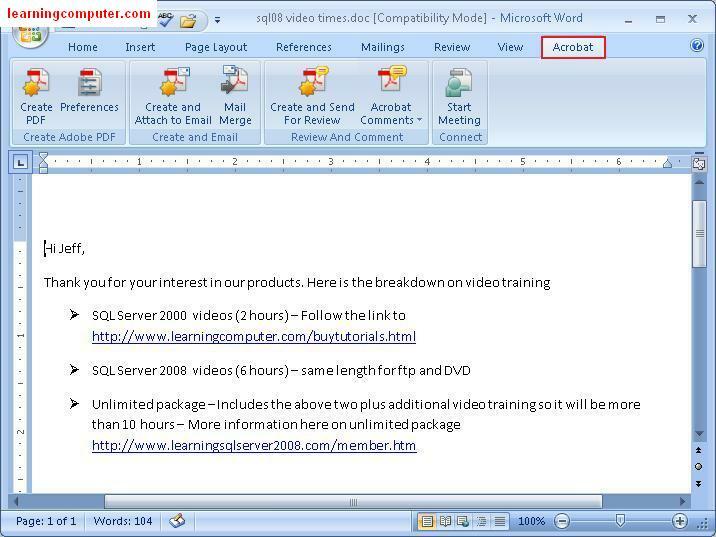 In order to use this functionality, you will need to use an email merge template that can be downloaded from the Microsoft website. There’s a screen shot shown below that highlights the needed steps. The next two commands have to do with reviewing and commenting in a PDF document. Using the Create and Send for Review command, you can use the PDF document with an email based review. Here’s what it looks like. You can also import comments from an Adobe PDF document into your current 2007 document. You would need to click on the command titled Acrobat Comments and follow the steps. One limitation regarding this is that you have to use a Tagged PDF document to import comments. Finally the last thing I want to mention about the Acrobat Tab in Microsoft Word 2007 is the Meeting feature. You can click on Start Meeting command under the Connect group. There’s a screen shot shown below. You can have an online meeting and collaboration using Acrobat Connect. You would need to sign up for a free trial before you can use this feature in Microsoft Word 2007. This concludes the lesson on Acrobat Tab in Microsoft Word 2007.